I enjoyed your photo series from Pyongyang, but I think you have confused communism with socialism in the descriptions of your photos 'Volleyball game', 'Mural', and 'Oppression'. There's quite an important distinction between a socialist country, like Norway (for socialist architecture maybe Oslo would be a more accurate location), and a dictatorship calling itself a communist democracy. 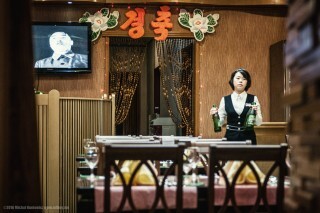 I really enjoyed your photos concerning North Korea. You took a big risk at uncovering the dedegration of its people, at all levels. I am not a photographer, nor do I know how the business work. I say that beacuse I don't under satnd why you didn't hide the faces of these people, when exposing them to the worldwide media. Exespecially soldiers and workers? Maybe you didn't have a say, maybe you didn't think about it. I know that there have been few that have done what you did in North Korea. It's just the humanitarian in me thought, I hope none of these poor people get found out they were in these mans pictures.Since, the person running this goverment is so extreme. With that said, turly applaud your bravery for reminding the world what is happening in this place.